Fictional treatments of small-town life have a long history in American arts and letters. Think of Thornton Wilder’s Our Town, the Christmas movie classic It’s a Wonderful Life, and the little village of Mayberry in The Andy Griffith Show. William McMillan’s new novel, Sticks, (Sleeping Bear Press, $22.95 SRP) is an amusing addition to the genre. 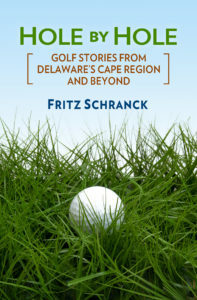 The book carries with it the added benefit of being a good little golf story. The Ohio village of Stowe Towne sits near a small river. It’s a longish commute to Columbus, the state capital, and was founded shortly after the Civil War by a group of seven veterans. Actually, the veterans’ wives oversaw the founding, and that fact still has a major influence on the town’s social life. A new company just located nearby, and some townspeople are beginning to think that Stowe could do with a bit more development. Some residents, like Howie Howard, are nicely poised to take advantage of these new opportunities. Howard is the powerful chairman of The Candlesticks Golf Course, the venerable semi-private layout that is the social center of Stowe. He lives next door to the course. Howard’s plans for a new housing project would alter “The Sticks,” as the course is known. By the way, it would also make his property available for a handsome profit. He lines up a major Cleveland land development company, and also retains a snooty golf architect to oversee the eventual renovations to the course. Some residents are not so sure this is a good idea. May Miller, the president of the local Daughters of the Union Army chapter, is a stickler for tradition. Once she learns of Howard’s plans, she mobilizes her chapter members and their golfing husbands to oppose the scheme. Sticks Bergman, whose own sizable acreage sits on the other side of The Sticks from the Howards, is an avid golfer who loves his home course just as it is. On the other hand, the prospect of new homes would be a good thing for his wife, a real estate agent. Besides, his brother is pushing to open a wine store in some vacant space in the family’s lumberyard, and the new upscale residents would be prime customers. Just to complicate things, Howard’s project requires legislation, because a state forest is involved. That brings into play a nervous state senator and an imperious state supreme court justice, who set up the management structure of The Sticks many years ago. A jaded investigative reporter, with the usual presumptions that everybody in government is corrupt, is sniffing around. McMillen understands that the complexities of life are not any simpler in a small town than they are in a larger urban environment. He cleverly develops an entire web of family conflict, economic anxieties, social climbing, outright greed, and double-crossing, with the golf course at the center. For observant Cape Region readers who grew up or now live in the area’s small towns, many of these sub-plots will ring true. The realism McMillen brought to this novel is both remarkable and funny. The segment involving a legislative aide for the state senator makes me believe that McMillen’s work experience must have included a lot of time in the state capital. These staffers are a peculiar breed, whose characteristics are well known to those working in government, but not so much to others. McMillen’s portrait of this minor character reinforces the sense that he is in familiar territory. The small town touches are well drawn. For example, readers who’ve been part of or subjected to the fundraising efforts of high school band boosters will laugh out loud at several junctures. It’s not a major part of the story by any means, but it’s a nice atmospheric effect. This is McMillen’s first golf novel. He’s off to a great start.